– The “Wu experiment” disproved conservation of parity: thought to be a law of nature. – Worked on the Manhattan Project, and made significant contributions to radioactivity research. – Was a fierce advocate of social justice in her later years. Chien-Shiung Wu (simplified Chinese: 吴健雄; traditional Chinese: 吳健雄; pinyin: Wú Jiànxióng; May 31, 1912 – February 16, 1997) was a Chinese-American experimental physicist who made significant contributions in the field of nuclear physics. 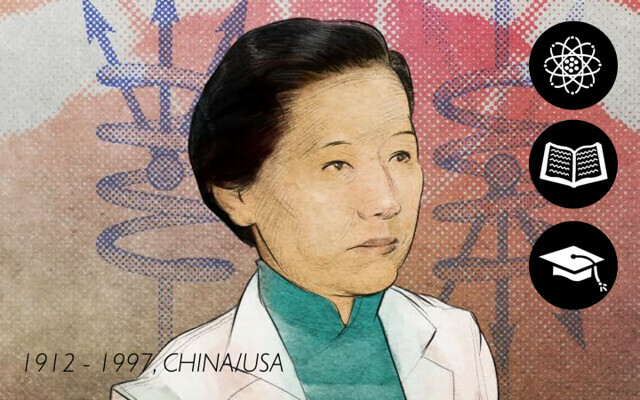 Wu worked on the Manhattan Project, where she helped develop the process for separating uranium metal into uranium-235 and uranium-238 isotopes by gaseous diffusion. She is best known for conducting the Wu experiment, which contradicted the hypothetical law of conservation of parity. This discovery resulted in her colleagues Tsung-Dao Lee and Chen-Ning Yang winning the 1957 Nobel Prize in physics, and also earned Wu the inaugural Wolf Prize in Physics in 1978. Her expertise in experimental physics evoked comparisons to Marie Curie. Her nicknames include “the First Lady of Physics”, “the Chinese Madame Curie”, and the “Queen of Nuclear Research”.